Before and After: Once an Office, Now a Home! A surprising redesign from an office to a cozy home. We have seen many home transformations already. There are those that were once a warehouse or a church and were transformed into homes. Amazingly, they all succeed in the design and one’s need for a home is easily satisfied by the designers through proper planning despite the challenges they may encounter because of the original design of the structure. But despite that, we have seen how the homes became very functional and usable. 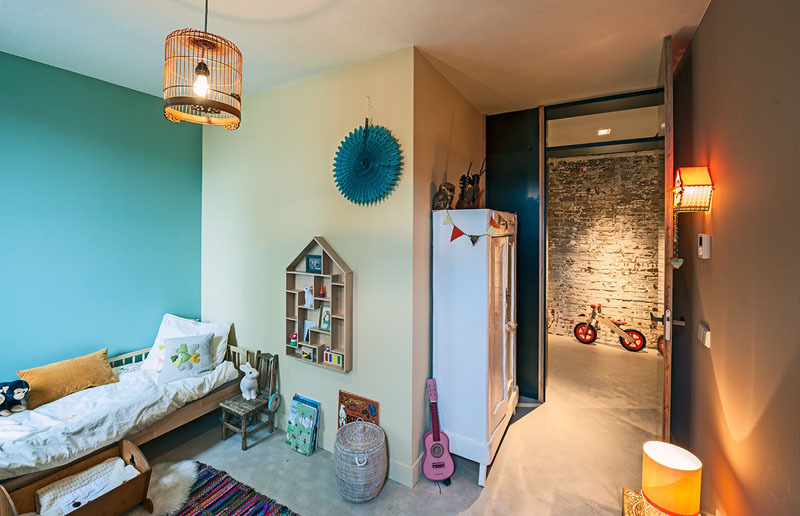 Today, we are going to show you a surprising renovation of an office that turned into a family home. 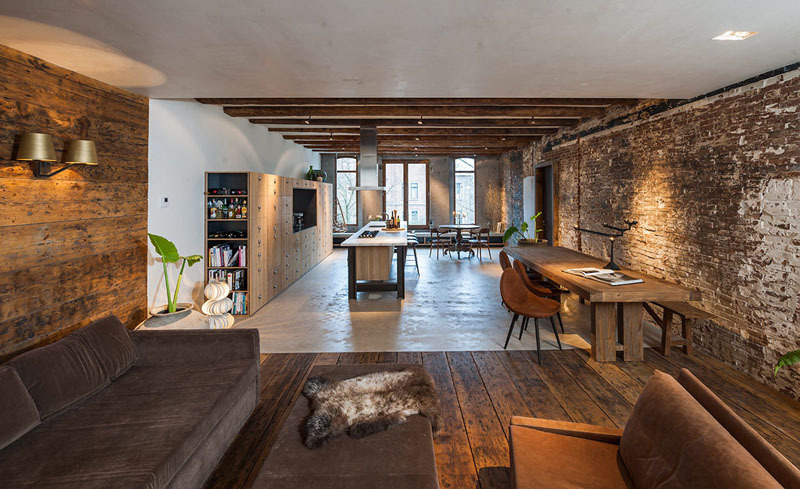 It was designed by Dutch firm TANK who made the standard conventional office space into a comfy and beautiful home for a family who lives in Amsterdam, The Netherlands. You will surely be amazed on how the space turned out. No one would expect that it was once and office space and not a home! 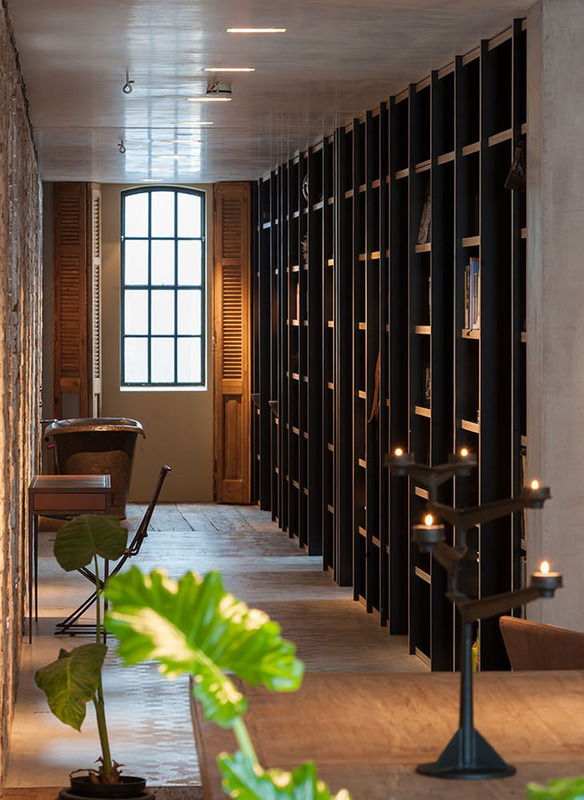 But I honestly like how they did the design especially when they stripped the walls and used the original brick walls instead. Looking really great! Come take a look at the images of the interior below. Unique feature: From an office to a home! 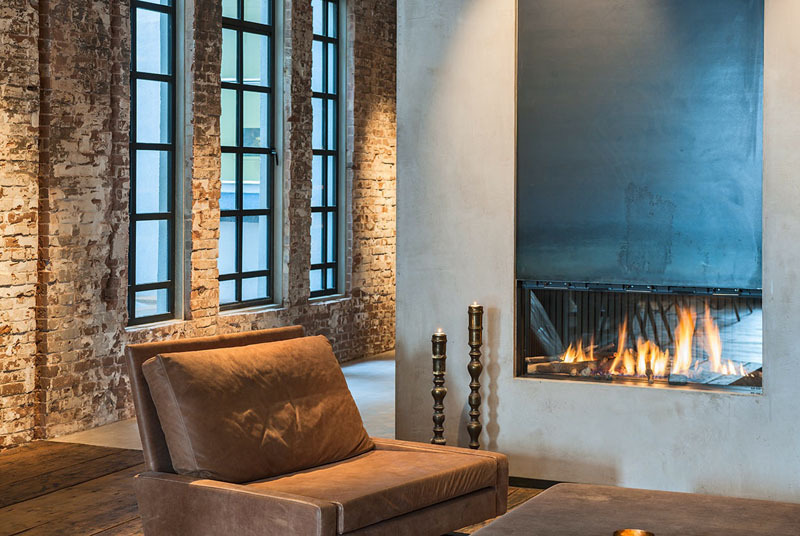 Stripped of its stucco walls, brick walls were retained for the house and it looks beautiful. Once you see how cozy the space is, you will be amazed about this transformation for sure. This is the house before the transformation. 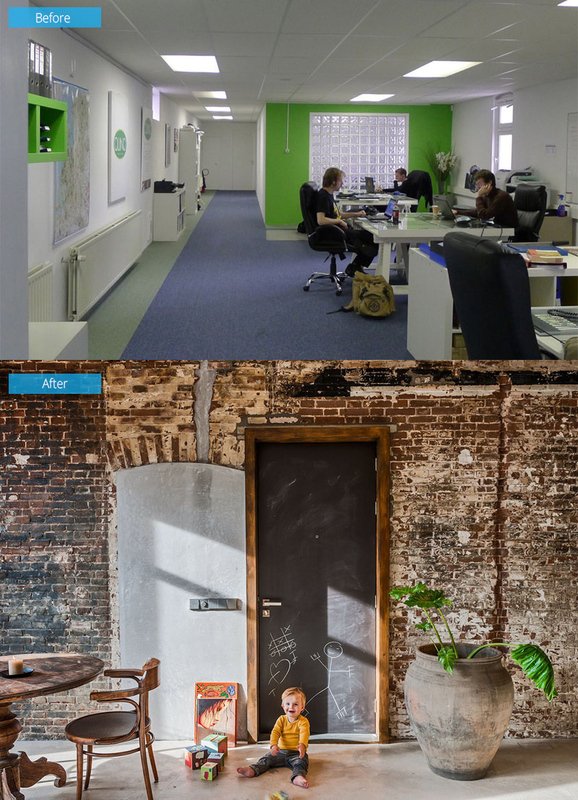 It was a neat office but the designers removed the stucco walls to reveal the original brick walls and doors. And it has an industrial beauty that fitted well to the theme of the house. 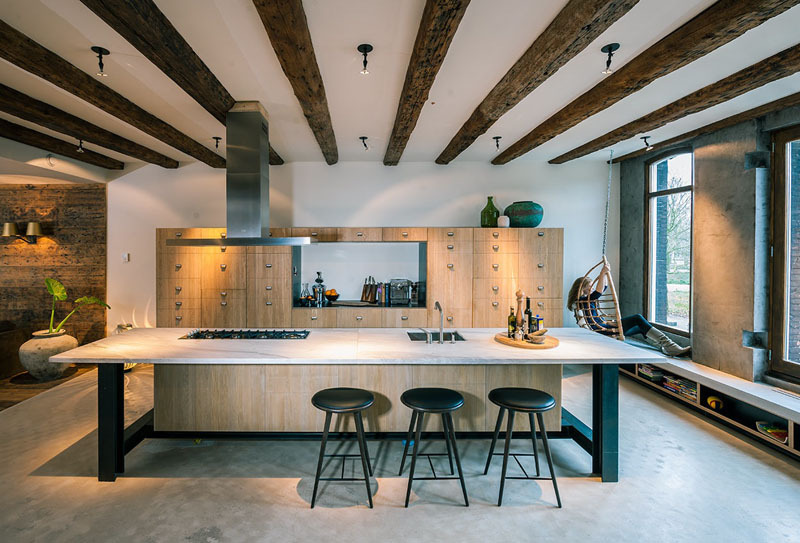 The kitchen, living and dining room share the same space in the interior and you can see that wood was added to the home on some areas. Touches of original wood were also kept throughout the space, like the black charred beams. This contemporary light wood kitchen is a new addition to the house with a large centrally located island. 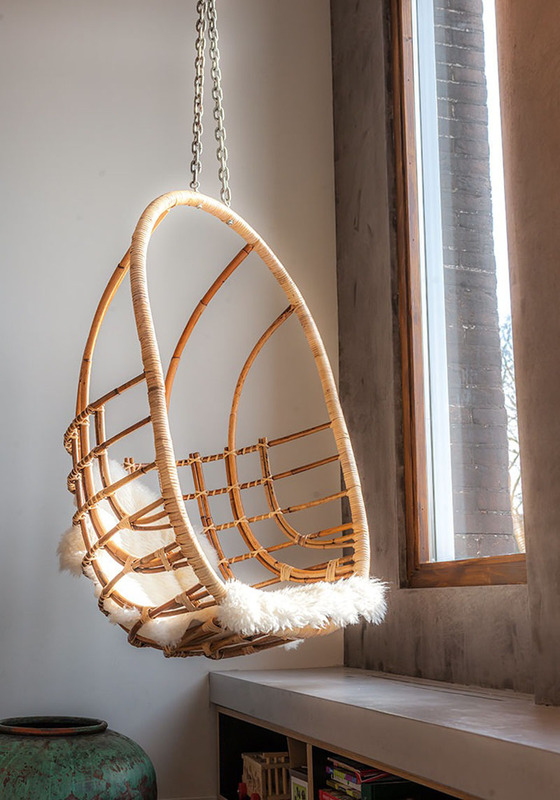 One fun feature is this hanging chair in the corner that allows you to gaze out onto the world. 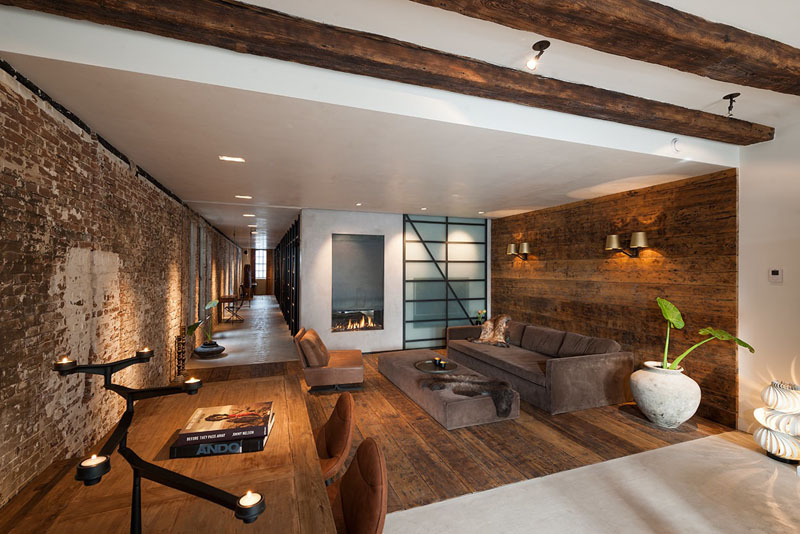 The living room isn’t only surrounded by the brick walls but it is also defined by a wood feature wall which wraps from the wall to the floor. The wood used here is 150 year old German pine boards. These pine boards were discovered when they pulled up the office flooring. The fireplace sits in this area where you can also find a lounge space. From there, one can turn into a hallway that is lined with shelves filled with books and others. And these shelves also lead to other areas of the house as well. Seen here is the line of bookshelves wherein at the end of it is a bathtub and a couple of sinks that are tucked into the shelf. 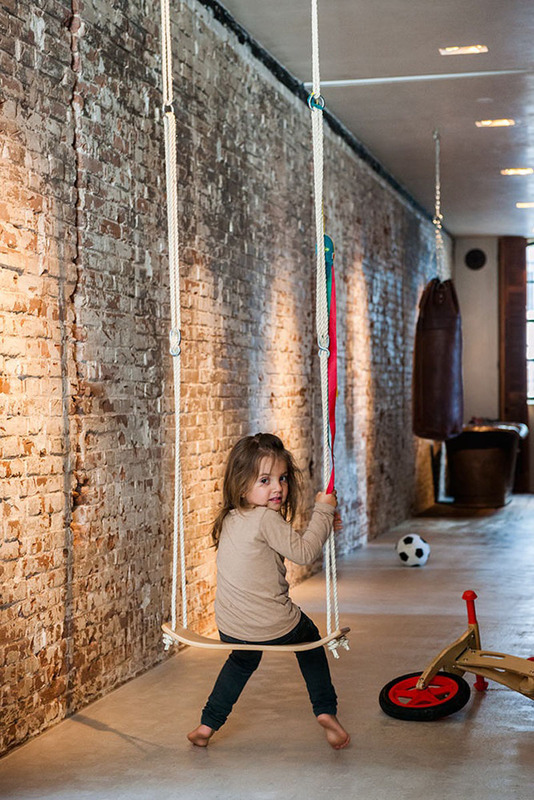 Aside from a hanging chair, it has another swing chair that is perfect for the kids to play and have fun even when they are inside the house. 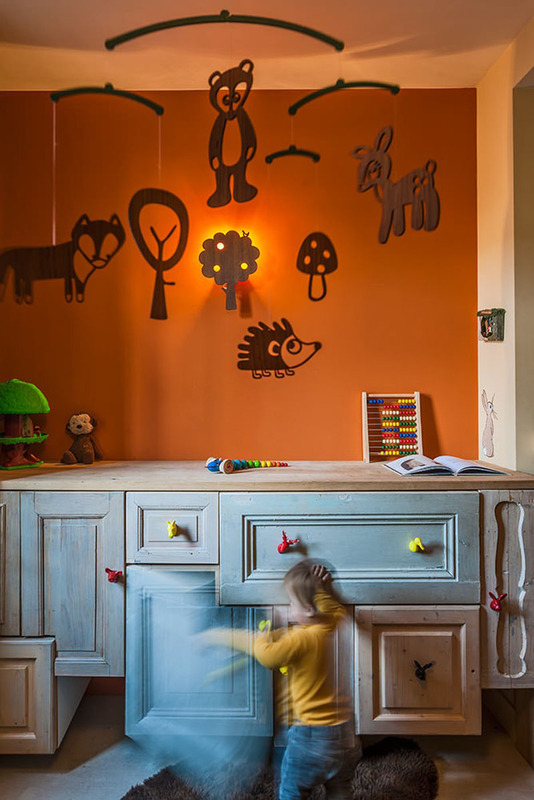 From the wall of bookshelves, one can access multiple rooms which include this child’s bedroom. It does look simple but there are many fun items inside it like the wooden cradle. This is the toddler’s bedroom with lovely wooden animal mobile. The bedroom looks nice and cute especially with the lights of the tree lamp on. 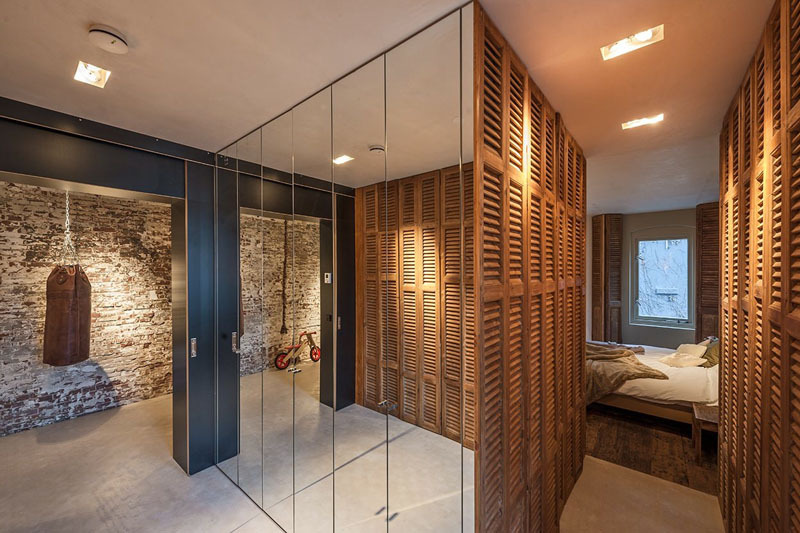 Down the hall of the house is an entrance of mirrors that welcomes you to the master bedroom. Notice here that there is also another line of cabinets. 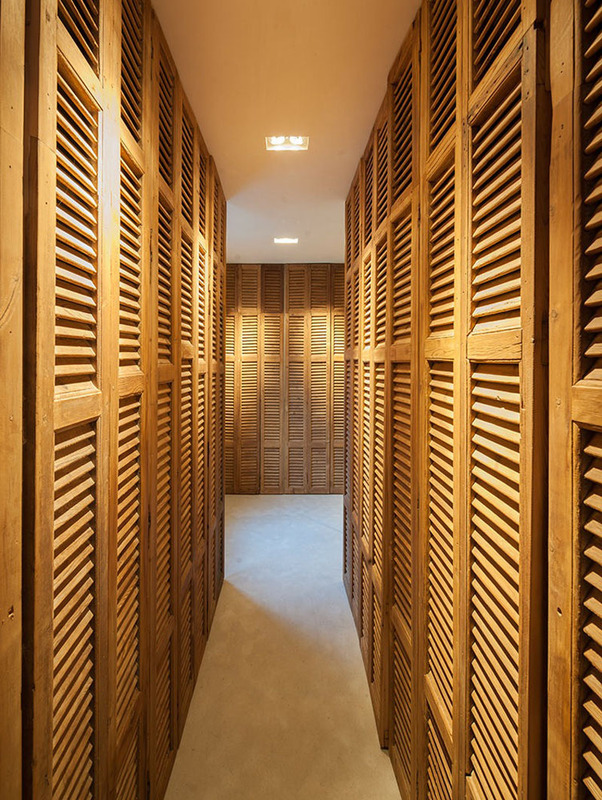 And yes, there are actually more cabinets because seen here are floor-to-ceiling closets that guide one to the bedroom. Now that sure is plenty of storage! 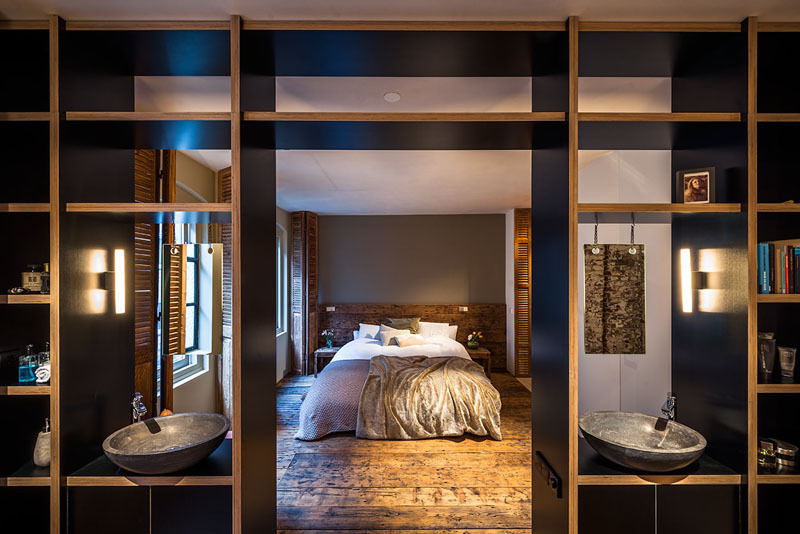 The spacious bedroom use a see-through shelf that divides the space from the ensuite bathroom. This shelf unit is just part of the large bookshelf that actually runs the length of the apartment hallway. This bathroom can be seen when one looks down the hallway. 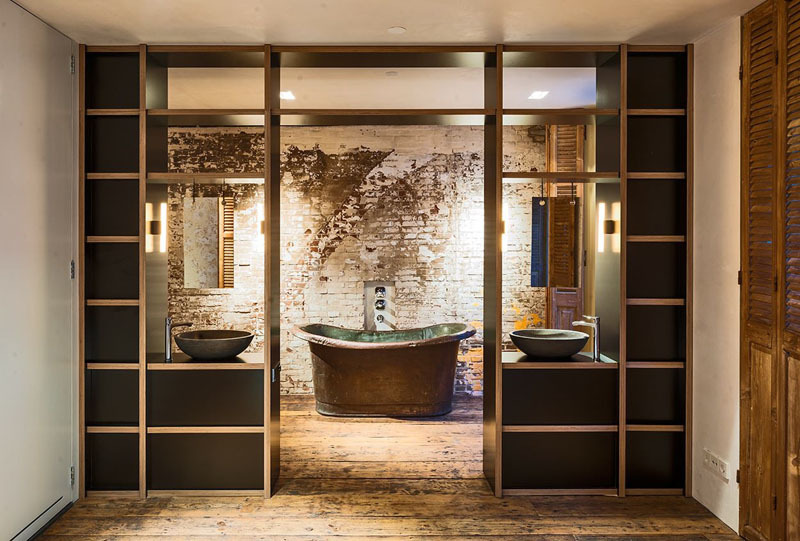 And it was a good idea to use a bath tub like that since it matched with the original wall made of bricks. It sure is an amazing transformation, right? We would all agree! Just look at the stunning home and all the fun elements added to it. This redesign was done by TANK and they obviously did an amazing job to it because we cannot even see any traces of its being an office, right? 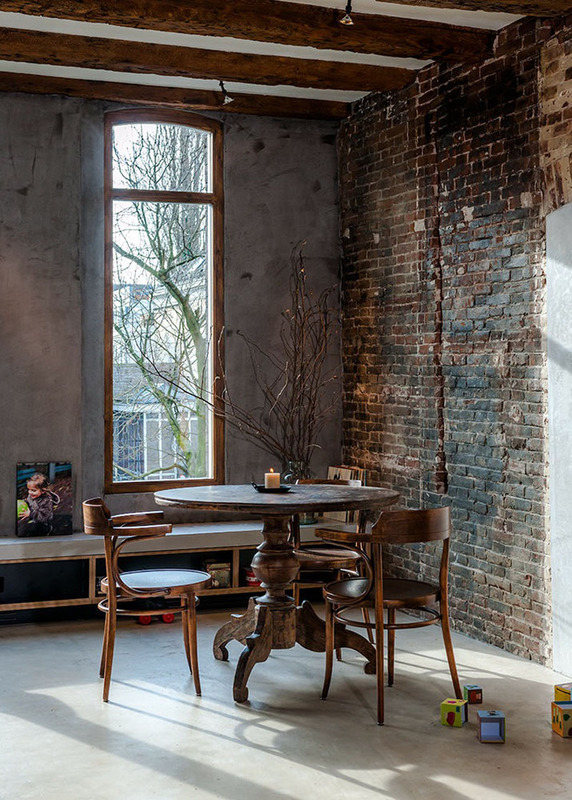 I like how it used brick walls in the house and also their choice of furniture. Such a lovely home indeed even if it is a mere renovation. What can you say about this?